We Raised More Than $650.00 At Holy Family! 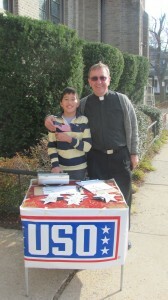 We raised more than $650.00 on Sunday, November 20, 2011. Thank you to the parishioners of Holy Family Church in New Rochelle, NY. I love that Holy Family is so supportive of Stars for Cars! I met all kinds of neighbors I didn’t know before. Thank you to Msgr. Berardi and Sister Connie for letting us sell our Stars. They encouraged people to buy the Stars by announcing the sale at all of the Masses last week and this week. They put an announcement in the bulletin as well. Sunday was a special Mass. It was the CYO Basketball Mass. I just started playing basketball. Thank you to my friends from Ward and who also go to CCD. They came by and helped my family sell Stars. Thank you to their parents for letting them do this. Thank you to all of the generous people in New Rochelle!